Even after more years of sailing than I care to admit,I can honestly say I learn at least something new every time I get out onto the water. 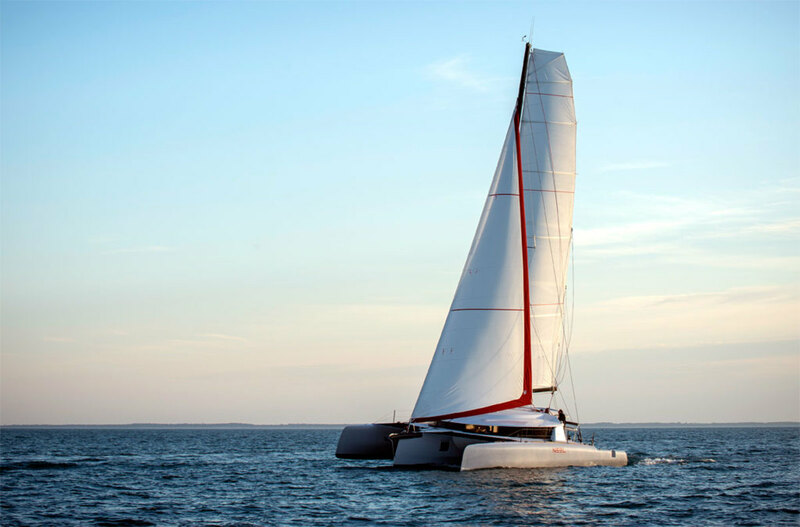 This goes double whenever I have an opportunity to venture offshore aboard a brand-new boat: triple when I recently had the chance to help deliver a brand-new Neel 45 trimaran from Charleston, South Carolina, to New York City. 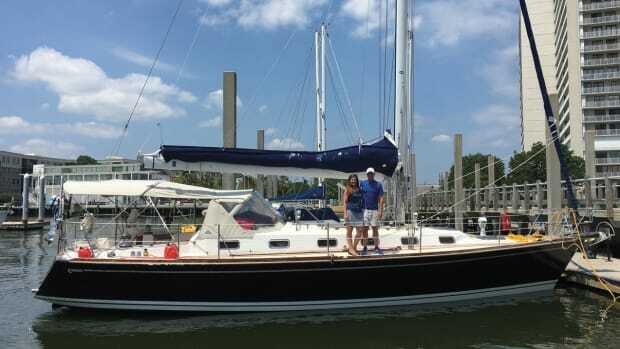 In fact, it would hard to imagine a better education than a 700-mile delivery on a schedule that includes a transit of North Carolina’s fabled Cape Hatteras—not to mention a lot of fun—especially for a dyed-in-the-wool monohull sailor like me. The fun started right out of the gate as we passed through the jetties guarding the entrance to Charleston Harbor and turned east-northeast, toward a waypoint a little over 90 miles away just off Frying Pan Shoals near Cape Fear. I hadn’t been real happy with the chill breeze I’d experienced exploring the city of Charleston the day before. But now the brisk 15 knots we experienced out of the north propelled us along at a sprightly 7.5 to 9 knots without half trying, thanks to the boat’s 1,140ft2 of working sail, in the form of a full-batten square-top main and slightly overlapping genoa. Doing my best to play the part of the serious sailing journalist, I took a turn at the wheel to see how the boat handled, but it hardly seemed worth the effort. The hulls, appendages and rig were so well balanced that in the minimal seas the boat tracked as if it was on rails. 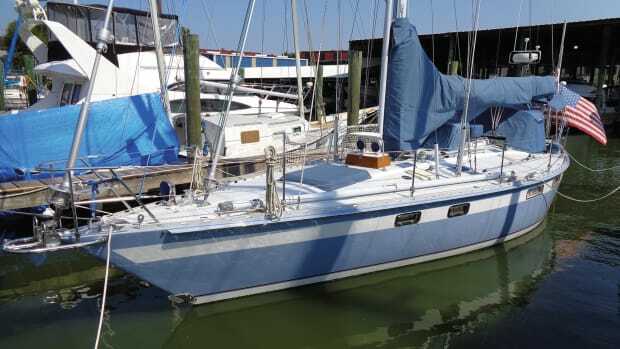 As is the case with many well-found performance multihulls, VMGs that would have been off the charts in my youth are literally effortless aboard a boat like the Neel 45. Later, as the winds fell light, we fired up the boat’s 55hp Volvo auxiliary to keep up our speed; our skipper, Greg Williamson of Charleston’s Ashley Yachts, was concerned about some heavy weather forecast to cross the rhumbline up ahead, and he wanted to be sure that Cape Hatteras was well astern if and when it hit. This, in turn, provided me with the first real eye-opener of the trip in the form of the boat’s tremendous speed, i.e. we didn’t slow down a bit. “I’m thinking the plan should be to motorsail whenever our speed drops below 7 knots,” Greg said, as we ripped along at 9-plus knots, our engine turning over at around 2,000 rpm as we hummed along under full main. “Uh, sure,” I said, at the same time glancing back at the hissing, arrow-straight wake stretching away astern. Suddenly, a 700-mile passage looked like no big deal. After that, we settled into the business of passagemaking—eating, sleeping, standing watch, sometimes just spacing out watching the watery world go by—activities all made that much easier aboard a trimaran with an impressive 28ft beam and a wealth of accommodation space. I’d felt a bit guilty at first when Greg said I could have one of the two massive double berths aft, but not for long. There was plenty of room for everyone. We were also lucky to have a great crew: four in all, with Edward James and Patrick Chipman, also of Ashley Yachts, in addition to Greg and me. There’s nothing like good company afloat, especially when that same company knows how to handle itself on a sailboat. 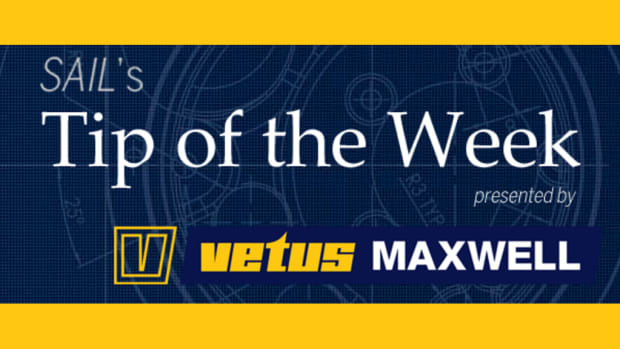 There’s also nothing like the two-hour watches made possible by a crew of four. Even standing a graveyard watch can be a pleasure: just as you’re starting to get sleepy, it’s time to rouse one of your fellow crew to relieve you. Two hours in pleasant weather often goes by so quickly, it’s almost disappointing when it’s time to hit the rack again. And so it went until 270 miles and about 29 hours later when we sighted Diamond Shoals Light off in the distance, about 13 miles off the dreaded Cape Hatteras. I confess, even though I should know better than to ever hope for rough weather, I was a bit disappointed with the conditions. 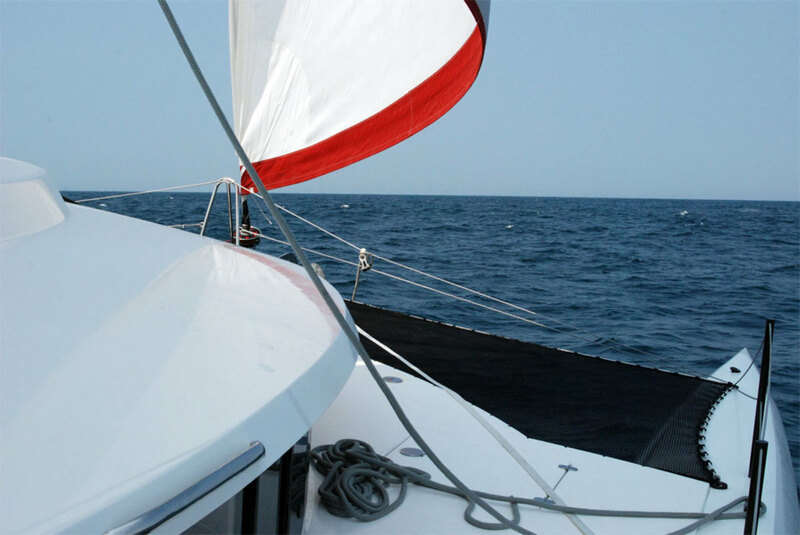 Because of the north-flowing Gulf Stream here, any kind of northerly wind can result in choppy or sometimes boat-breaking seas. However, we were blessed with a gentle 7 to 8 knots out of the southwest as we ripped along under power at a whopping 11.5 SOG with the help of the current. By way of consolation, Ed entertained the rest of us with a yarn about how he’d once spent days trying to beat south around Cape Hatteras to no avail—think contrary winds, rough seas, sick crew and broken gear—as Greg altered our course to north-northeast, toward Long Island’s Montauk Point about 390 miles away. In no time, I not only had a much greater appreciation for the zephyrs and sunshine we were experiencing, I even found myself acting my age and being thankful for smooth sailing. Better still, around midnight that same evening Greg shook me awake and said I had to come on deck to see a pod of dolphins that had recently appeared. Not sure what there would be to see in the dark of the new moon, I came up on deck to find Patrick stretched out, face-down on the portside tramp staring intently at our three bow waves. What in the world? I wondered, and then I saw a cluster of glowing white streaks shooting directly toward us like a spread of bioluminescent torpedoes. So quickly did they travel that it was a little unnerving, until the three dolphins—for that’s what it was, a trio of dolphins swimming toward us at top speed—arrived directly in front of the boat and started racing ahead of us. As they did so they glowed with such clarity that it was like we were racing a trio of waterborne ghosts, and the next thing I knew I was lying face down on the tramp as well: watching them swim along maybe 3ft away, listening to them breathe, occasionally getting splashed by their fins slicing through the water or the spray coming out of their blowholes. Eventually, they sped away, to be replaced by a soft glow in the distance that quickly resolved itself into another spread of glowing torpedoes. Soon afterward they tired as well, only to be replaced by another group of dolphins: and so on and so on, right up until it was time for me to go on watch at 0200. By now the wind had fallen completely calm so that the entire Atlantic Ocean seemed to glitter faintly under the moonless night sky as our triple wakes stretched out equally bright astern. It was one of the most incredible things I’ve ever experienced at sea; a scene I fully expect to continue looking back on until my dying day. 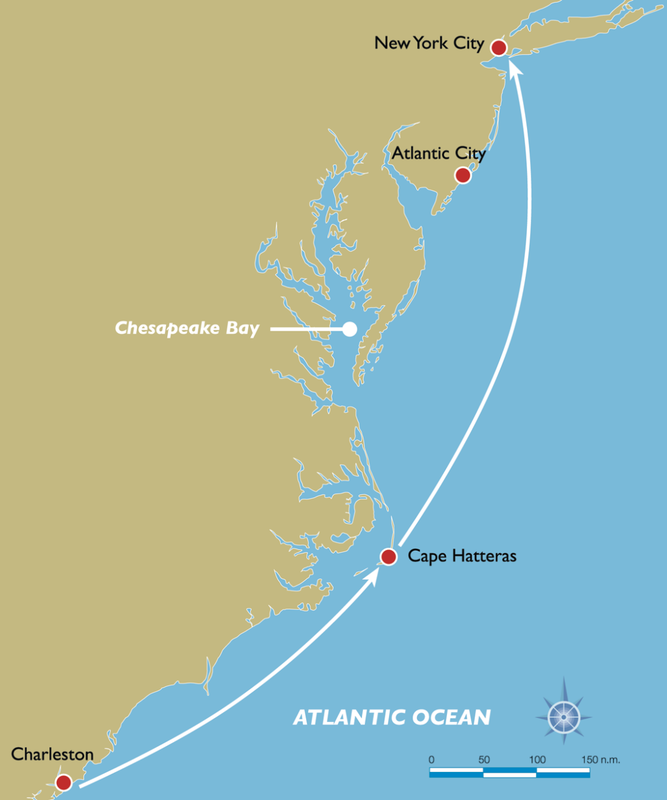 By 1000 the next day we were about 100 miles northeast of Virginia Beach, Virginia, cruising along at around 8 knots, occasionally touching 9 as we surfed down a bit of swell. It already felt like we were in the home stretch, having left Cape Hatteras astern. However, there was now a bit of a fly in the ointment in that Greg and Ed were becoming a little concerned with our fuel reserves, having burned through so much to beat even the possibility of encountering bad weather. Granted, the plan all along had been to throttle down and do a lot more sailing during the second half of the trip, once the cape was behind us. Not only were we now down to about a quarter of a tank, but Ed was worried that the gauge might be reading high, in which case our motoring time might be very limited indeed. Greg was also beginning to worry about the edge of a band of severe weather straddling our rhumbline to Montauk. 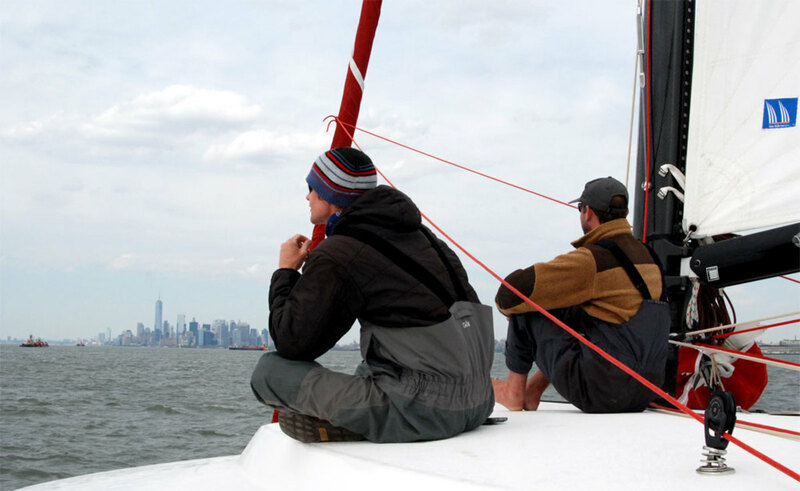 After a quick conference with Ed, he elected to stay a little closer inshore and make landfall in New York City.  The crew could then continue on to Mystic, Connecticut—the boat’s ultimate destination—by way of Long Island Sound. Luckily, on the plus side, at the same time Ed switched off the engine in the wee hours of the morning, the wind also started picking up, so that by the time Greg altered course for the Big Apple we were doing around 8 knots with 11 knots of wind on the beam. Better still as the day progressed, the wind continued to build until we were humming along at 9-plus knots in 14 to 16 knots true, hitting 10, 11 and even 11.6 knots in the gusts, with the boat perfectly balanced under autopilot. Around 1400 Ed saw what he thought was a shark dorsal fin to windward, only to have it turn out to be a Sunfish flopping around on the surface, which was better still. Two hours after that, we were all relaxing in the saloon when we saw an absolutely enormous dorsal to leeward, which we all immediately decided was a Great White—until we saw another slightly smaller fin about a half hour later, and decided they were probably both basking sharks. Alas, it was just after we were making these fun marine sightings that our luck ran out in terms of smooth sailing. Or to be totally honest, it was at this time that our complacency caught up with us as the true wind speed suddenly decided to ramp up from the high teens, where it had been for hours, into the mid-20s. One moment were we all hanging out in the saloon speculating on the sharks we’d just seen. The next, a gust powered up the rig, overwhelming the autopilot and causing the boat to round up into the wind where we immediately found ourselves stuck in irons in the building seas—and yours truly received his second big eye-opener of the trip in the form of a sharp lesson straight out of the school of hard knocks. 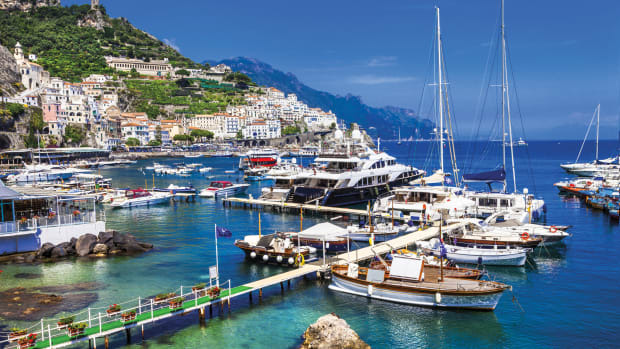 As anyone with any performance multihull experience knows, the rigs on these heavily canvassed boats power up fast, and we now found ourselves having to deal with that surfeit of power on the edge of control. Eventually, we got the boat back on course, but moments later the autopilot lost control again. It wasn’t the boat’s fault. It was ours. We’d been caught with our pants down and too much sail up. Worse yet, so complacent had we become (or is the operative term, lazy?) that we’d never bothered checking out the staysail that Greg and Patrick had set up on a tack point up in the bow back in Charleston. 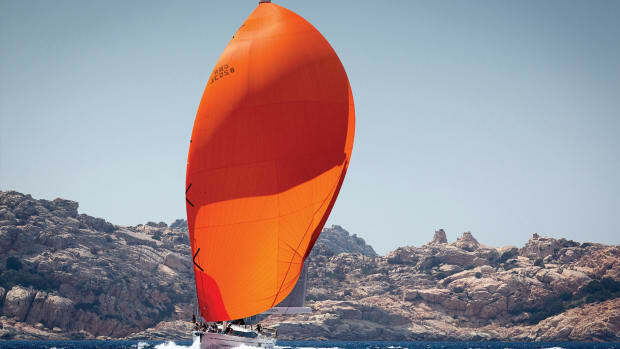 As a result, after tucking in a couple of reefs into the main and finding the boat still overpowered, we were faced with the choice of either 1) carrying the full genoa or 2) figuring out how to work a new sail in an increasingly wind and building seas. Partially rolling up the genoa, of course, did no good at all, since it quickly developed all kinds of excessive draft, which only exacerbated the problem in the heavy air by making it that much more powerful and less aerodynamically efficient. Mind you, we’re talking four veteran sailors here (and a good thing, too, given the size of the main we had to reef). Just goes to show that you’re never to experienced to make a rookie mistake. Eventually, we had no choice but to roll up the genoa and motorsail on a close reach as best we could to avoid being blown deeper into the heavy weather to leeward. Because the autopilot was having such a hard time—and because getting a multihull back on track once it’s in irons in a seaway can be so difficult—yours truly was now hand steering, which would have been fine, except for the fact that the sun was now also going down, and of course, we were low on fuel and needed to keep the engine revs to a minimum. Granted, ours was by no means a truly dangerous situation. However, it was quickly becoming more than a little inconvenient, shall we say, and looking to the west, at the gray and orange sky and an ocean full of bigger and bigger waves bearing down on us, I began thinking we could be in for a very long night indeed. About an hour after I took the wheel, a U.S. Navy vessel went churning by in the opposite direction, maybe a mile and a half to leeward. Truth be told, I couldn’t help feeling a bit jealous of the sailors onboard her having a warm dinner and maybe watching a movie. I can only imagine what our little boat looking like, slicing its way to windward over those angry seas. Fortunately, Greg more than made up for his role in our group complacency by way of his route-planning. And after a couple of hours of balancing on the knife edge of maintaining position to windward without rounding up, the winds began to abate, so that I could switch on the autopilot again. 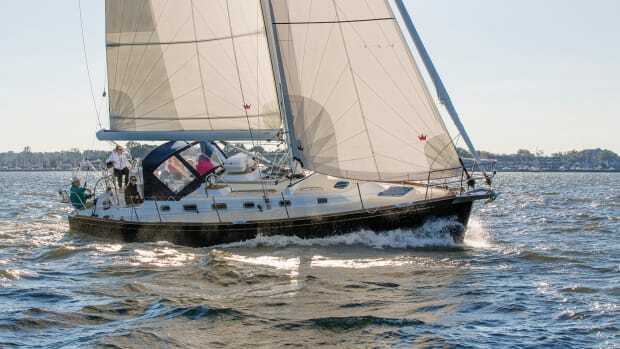 Better still, throughout it all the Neel 45 fought bravely on, more than making up for the inadequacies of her crew: so much so that even as I was at the helm, I found myself wondering at how well the boat was contending with the conditions. On the one hand, the wave-piercing bows on all three hulls worked magnificently, piercing when they might have otherwise been hobby-horsing. On the other, it seemed that having two smaller amas straddling a larger central hull resulted in a much more forgiving motion laterally than would have been the case on a catamaran. 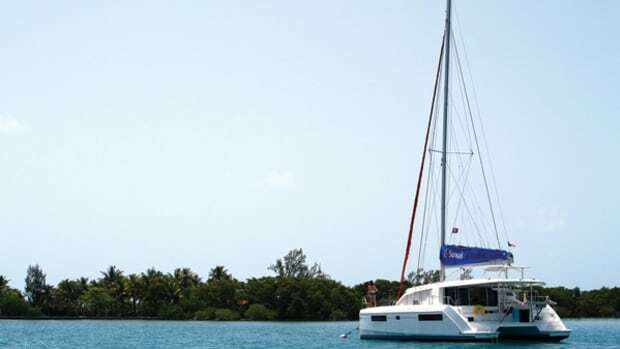 I’m convinced it would be hard to find another multihull afloat that would have dealt with the conditions as well as the Neel did. From that point on it was all smooth sailing, so that when it came time for me to stand my watch at 0200 we werepowering along on a close reach with the wind in the low to mid-teens. Blasting through a fleet of trawlers hard at work off New Jersey in the middle of the night called for some very active watch-standing. But the combination of the boat’s AIS and the outstanding professionalism and courtesy of the half-dozen fishing captains I spoke with via VHF to ensure we all knew what the other was up to, made for a very satisfying two hours of night sailing. Later, as the sun rose the winds began building again until we were doing 10, 11 and even 12 knots in 20 knots of wind. This time, there was nothing heavier forecast for the rest of the day, so we kept the genoa up and reveled in its power as we ate up the miles, at the same time dodging the occasional fishing buoy. Once again, we were all being treated to some of the most magnificent sailing any of use had ever experienced—at least until we approached New York’s Verrazano Narrows, straddled by the bridge of the same name. Coming within view of Coney Island, I wondered aloud whether we might not want to get rid of that big beautiful genoa before we got whacked by what looked to be some powerful gusts roiling the waters in the channel when—wham! school was back in session as the wind ramped its way back into the mid-20s. This time, however, it was Ed’s turn to take the helm, as Greg, Phil and I rolled up the genoa, and he got things back under control again as we entered the great waterborne thoroughfare that is New York Harbor. Of all the landfalls of the world, I’m convinced that it is one of the finest, with the Manhattan skyline in the background, ferry and tugs rushing back and forth, and Lady Liberty looming overhead. The history of the place alone, is enough to take your breath away. In my own case, at least, it also seemed like the perfect place to finish what had truly been one of the most eye-opening and deeply satisfying deliveries I’ve ever experienced.